It is Spring and the birds that live along the ponds and marshes nearby, are busy building nests, courting mates and raising babies. It is the order of things after all. The golf courses in my neighborhood wind in and around their homes and a Saturday on the links can be as much sport as nature exploration. The Sand Hill Crane has taken a special liking to this area in recent years and gracefully pokes around back yards until a bug or worm is exposed, loudly express themselves with their trumpeting calls, and fly in formation looking like a combination of the Concorde and prehistoric T-Rex. Most of the human population has taken a liking to the cranes. We marvel at the mating dance, the loudness of their calls and their sheer size when then soar overhead. We coexist well. They even act as gallery for the golfers. A month or so ago, a pair of cranes had two babies. Now, another pair has become new parents. The adult Sand Hill Crane stands between 3 and 4 feet tall. This gray plumed bird has a distinctive red blaze on the top of its head. The babies are born with reddish brown feathers and their shape resembles more of a large gourd than a bird. Mama and Papa birds closely guard their young from predators and stay together as a family unit up to 10 months. The first brood look more like teenagers now. Kind of gangly, feathers more gray and a top-knot that looks like a mohawk. 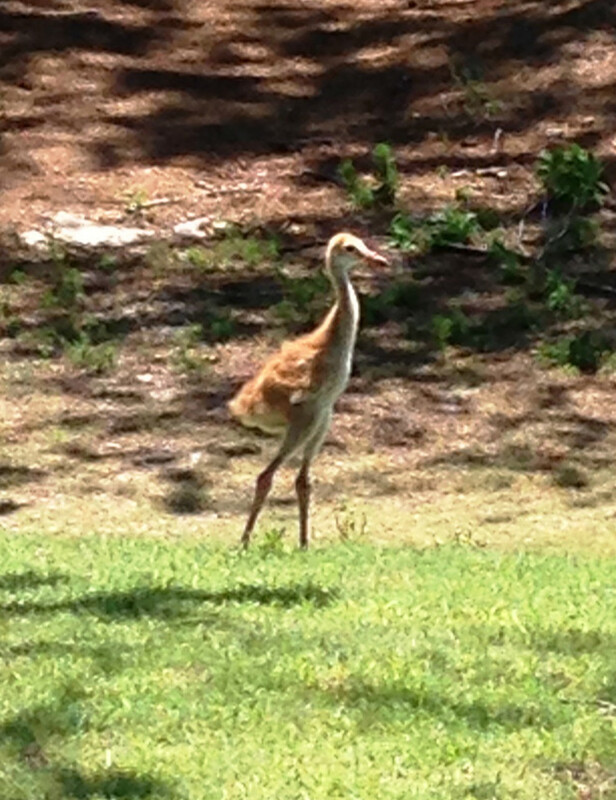 The baby cranes appearance has certainly slowed play on the golf course as carts swing nearby to capture cell phone shots of the youngsters. They are quite a sight to see.